One of my goals this year is to start using my Canon camera much more. I used to have my old Panasonic Lumix camera velcroed around my neck. I've gotten lazy with the phone camera...I think a lot of us have because it's more convenient. But nothing beats a real zoom lens on a good camera! I took this photo from my office as the Blue Jays fed on the sunflower seeds. The glare on my window shows you how sunny it is today! This little fella waits for me every morning in the tree just above the feeder. He watches quietly as I take each dog out then as I fill up the feeder, he chirps with delight! Another photo through the window. I'm going to make more of an effort to sit outside in the mornings to get better shots of the visitors at the feeder! 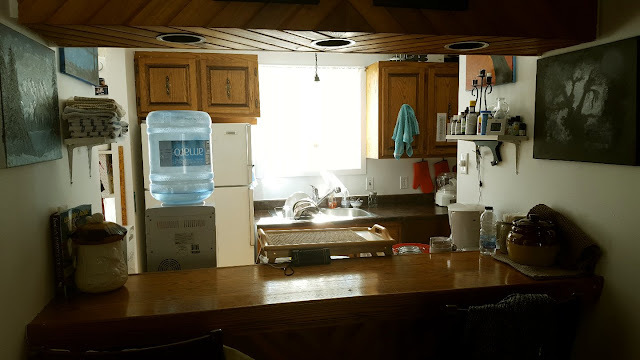 My Blogger friend Wisps of Words asked if people would share photos of their kitchens. Some Bloggers have such nice kitchens...oh I wish!!! Mine is the size of a cubicle lol...but I pack plenty of cooking and baking into it! This is the view from my office, not much room huh? You're all recognize this view, from the "breakfast bar" area. This is where we eat and I photograph all of my foodie shots. When we look for our home to buy, a bigger kitchen is on the wish list. I have a little window that also gets lots of sun. The cats were using it as a viewing area, but I've decided some shelves are going up there for more seedlings. Thank you for the kitchen photos!!!! Sweet photos of your fur babies. So very sweet. Hi Rain a zoom lens that’s a canon! You couldn’t ask for anything better. Enjoy your photography! You will have endless hours of fun while you’re doing it. It’s nearly our tea-time. All of those vegetables. Mmm. I can’t wait. Tomorrow is day 72. What a lovely fur family you have! And the blue jay pic was very nice; looks like a good gossip session happening there. Big congrats to Martha!! Your new camera is amazing, incredible shots. throughout my life i cooked in some tiny kitchens too! we are having a bright sunny day too. i hate sunlight. i should live in a cave! Thanks for reminding me to start using my camera again. You take amazing photos. I love your fur baby photos.Charlue doesn't look happy lol. Stella looks clueless. They all look like they have fun personalities. Love the photo of Oscar licking his chops. Your Leo reminds me of our Tom. ...still miss him. I didn't realize they had birds and squirrels in the arctic! I use a digital with a good size lens, it won't fit in any of my pockets unless it is a large coat but the large lens doesn't distort things as much as one of the tiny thin cameras or phones do. A good lens is more important than how many megapixils since after it reaches a certain point it doesn't really matter. Oh...hahahaha! I saw my photo and for a second my brain didn't kick in and I thought "Well, what the heck is my picture doing here." Then I read why. That is wonderful! I'm so happy about that. I'm one of those people that never wins anything and here I am winning. Now it's not never, just...occasionally :) Thank you, Rain! All the pets are so cute. Dana looks like my Mocha! I don't know how you manage to take care of so many. We only have two cats and that's more than enough. Lots of furry love over at your place. Like you, I've always wanted a nice big kitchen but this is our final home, so that's never going to happen. Whenever I see those beautiful kitchens with those big islands that you can work on, I drool. LOL I do hope you get it, Rain, since you enjoy creating some wonderful meals and desserts! Have fun with your camera! I look forward to more of your images. How lovely about that little squirrel. Photographing animals is always such a joy. I did tons of photography while we were in Kingston and it was such a great time. Then we got into the whole mess of selling our other house and the problems that came with it when it wouldn't sell and the rush to find a home when it finally did and moving to another city and the renovations throughout last year and on and on... I'm exhausted just thinking about it. In that craziness with all that stress, I stopped doing photography. But this year that it's quieter, we intend to go on road trips and adventures, and I intend to start taking pictures. So here's to photography in 2018 for both of us! That's a neat shot of the bluebirds. They're happily frolicking about, eating, and socializing. I like the light you got in the photos of your dogs. Oh, what beautiful pictures of the jays and the little squirrel. Had to smile at that one. I uses to cook in a hospital kitchen that was huge....wore me out just going from one counter to the stove to the fridge. Now I have a small kitchen like yours where everything is at my fingertips and still enough counter space to prepare cooking and baking. Those expressive eyes on your fur babies..beautiful portraits. Enlarge them and print and hang on your wall. They are so lovely. Hi Tpals :) That's funny because I used to call it the "Blue Jay Pub" when all the jays were around the feeder squawking at each other, felt like a gossip fest to me too lol! Hi Joyce :) Lol...a cave, that's funny ha ha....I was telling Susan from ei ei omg that I used to watch a show where this older guy lived in a cave and he was very content! Yeah, the kitchen is way too small, hard to navigate, but it was build for a weekend cottage, not for every day cooking. Hi Marsha :) Thanks :) I hope you get your camera out too. It's so much fun. Charlie is NOT happy...she's in heat right now poor girl, kind of painful for her. Stella is always looking around, listening for sounds! Hi Martha :) Tee hee...glad you were surprised! Ha! You probably thought I was nuts posting your photo like that! ;) I was so glad to see your name come up! :) For me the dogs are easy, well, all of our pets are easy...NOW. When S&P first arrived, as you know, it was terribly stressful and difficult, but they are all settled, so they work well as a pack. The cats too, all but Dana are okay with the dogs. Dana still tries to swat at them, the little devil. Hi Tewshooz :) Thank you! Oh yes, the little squirrels make me smile too. They are so innocent and not at all afraid of me or the dogs, though I can't get too close. They make great photography subjects! :) I appreciate what you said about my photography, that was very sweet :) I think that if my kitchen were twice this size, I'd be happy! My kitchen is just as small! 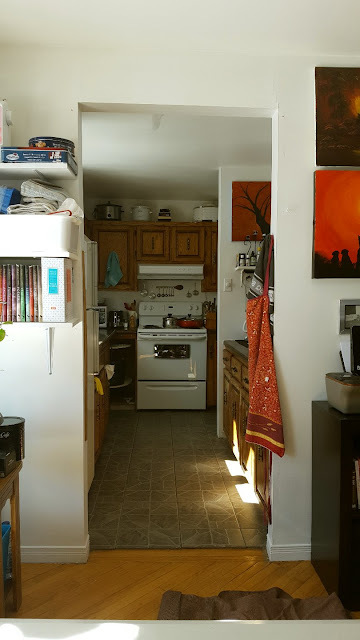 I refuse to post a picture though as right now the counters are a cluttered mess....The sad part is that compared to the apartment I was living in the kitchen here is quite large! Hi Ruth :) Oh gosh...I should remember some of those apartment kitchenettes when I complain about my tiny kitchen lol! I just find it difficult because there isn't much storage and the storage requires me on my knees digging things out or on a ladder grasping. It's not very user-friendly. You DO have a small kitchen! But, oh my, the wonderful food that comes out of it! Do you have a kitchen plan for when you buy your property? Of course, you could end up with a nice house on the property so you wouldn't be starting from scratch or building your kitchen from the ground up. That's okay. I've made some pretty nice kitchens in houses we've bought. My kitchen before this one wasn't too much bigger than yours . . . and I had a wood burning cook stove in it! Your animals all look so very healthy! What loving care you and Alex give them. Thanks Nancy :) Lots does come from that tiny space :) I can't wait to get some more seedlings started but I think I should wait another month! I like the Blue Jays. We do not get such nice ones down here. Great close up shots of all the animals!! Especially the dogs...I love dogs the best. Well, I think your kitchen is lovely, cosy even, and it's about three times bigger than the kitchen we had growing up (that was converted to a bedroom closet after the new owners moved in)! the pics of the animals are all so beautiful. Yes, i would love a real camera and often think we should save up for one to take zoom photos like you have plus to print high res but then I;d have to lug that around too in our travels so never get around to it but it is sorely tempting as your lovely shots show too, Rain! Hi Michael :) Ha ha...converted into a bedroom closet! That's crazy...very small I should feel lucky to have the one I have! It just doesn't have much counter space and there's a lot of clutter, which I can't stand. The phone cameras are pretty good these days, but nothing really beats that zoom lens. Alex got me the camera for my birthday a few years back. It was a few hundred dollars, but we waited for a sale and got it at a very reasonable price. It works very well! Such a beautiful post Rain! Love seeing all your outside friends!! Your kitchen is cute! Congrats Martha! Big Hugs to all your cute fur babies!! Love your photos of the 'wild life' and the dogs and cats. Great one of Oscar with his tongue out. How did I miss your posts. I swear I've been in a fog since the girls got ill. Your kitchen look so neat and clean. I love the idea of making a new recipe each week. I need to try that orange pie. My daughter and I are both nuts over anything citrus.